A newly released children’s book. “I Love You Like…,” was inspired by a long friendship and a father’s love for his son. Scott Sutton and Alec Traub, co-authors of the book, met while working at Phi Kappa Psi Fraternity headquarters in Indianapolis 15 years ago and have been close friends ever since. However, their friendship became long-distance when their careers took them to opposite sides of the U.S., with Sutton now living in Pennsylvania and Traub in California. They kept in touch through text messages and email and soon began ending every message with phrases like, “I miss you like the grasshopper misses grass … and hopping.” Sutton collected all of the messages with a goal of someday incorporating them into a book. The day arrived sooner than he expected. 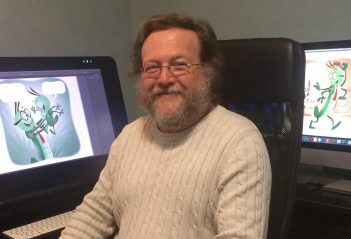 When Fishers resident Glenn Zimmerman, director of animation at Paws Inc., heard that Sutton and Traub were looking for an illustrator for their book, he volunteered and worked with the pair for five months to create “I Love You Like…”. Two years ago, Sutton was diagnosed with stage IV neuroendocrine cancer that began in his lungs, then spread rapidly throughout his body. The diagnosis inspired him to finally start the book, which he dedicated to his now 3-year-old son, Alec, who he named after Traub. “I Love You Like…” is available on Amazon for $9.95. For more, visit grassandhopping.com.